cleansing and clarifying: Beets and cabbage are friends. Beets and cabbage are friends. This little dish here, I got the idea from the Cahute residence. It was my first cooked dish since the detox. I want more already. Steam the cabbage, fry the beets, add in the celery and onion bits, add some garlic powder, and some lemon juice too. Mush this all together. 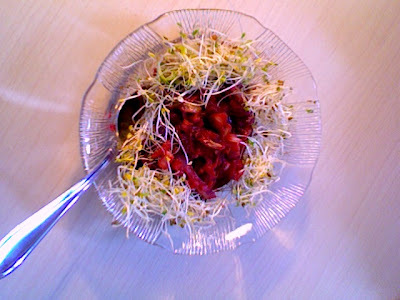 Add some sprouts, because sprouts are vital! Thanks, Cahutes!